MD/CEO Total E&P Nigeria Ltd, Nicolas Terraz (right) presenting a cheque to representatives of the Pacelli School of the Blind and Partially Sighted People during the Total Charity Golf Tournament held at the Ikoyi Club…at the weekend. Winning the 22nd Total Charity Golf Tournament at the Ikoyi Club 1938 gave Ola Mustapha of the Abeokuta Club a lot to savour, especially as it came with the knowledge that he has contributed a little to the lives of the less privileged. Mustapha scored 39 nett to beat Jude Okafor (35) and Richard Iweanoge (34) to the second and third positions respectively in the tournament graced by top golfers from Ikoyi Club and some sister clubs. For his efforts, Mustapha got a Callaway Bag, while Okafor and Iweanoge got Adidas golf shoes each. Peter Eben-Spiff won the Men’s Gross (-33) category, which fetched him a Callaway Bag, Rita Okafor also got a Callaway Bag for topping the Ladies Net, while second and third placed Ifeyinwa Ohakwuba and Idowu Babalakin got an Adidas golf shoe and a golf shoe respectively. For being the first in the Total staff category, Obinna Okoli got a Callaway bag, while the second and third placed Reuben Eguche and Samuel Nwankwo took Adidas golf shoe and golf shoe respectively. Aside the prize he won, the 68-year-old Mustapha said he was thrilled by the fact that his presence has helped to bring joy to children of Pacelli School for the Blind and Cancer Aware Nigeria, who got N1 million each. He explained: “I came to the championship to do my bit for the less privileged in the society because there are so many needy people out there. “When I entered for the competition, I called my wife to tell her that I am going to play for charity and that when I turn 70 in the next two and half years I want to leave one third of all I have to charity. Also speaking on the tournament, Rev. 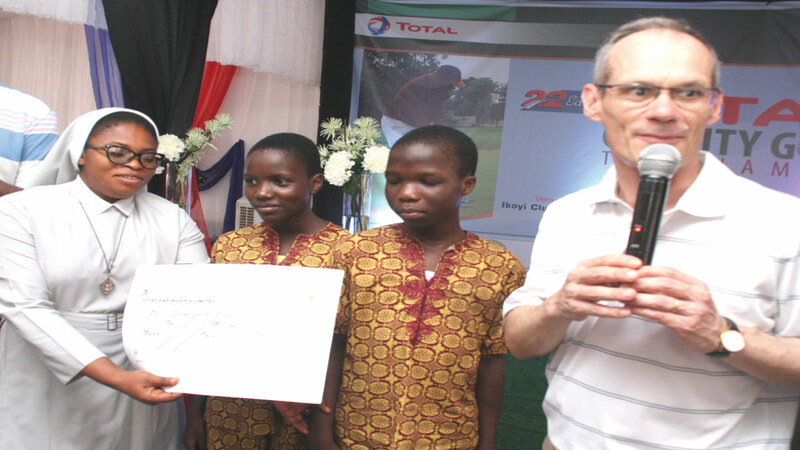 Sister Agnes Onwudiwe of the Handmaids of the Holy Child Jesus, who led children of the Pacelli School of the Blind and Partially Sighted People to the event, thanked Total for bringing succour to the needy. She said, “They have added to our joy, our happiness. When we were told that we were coming here to collect something from Total we were very happy. Since the principal is not around, I was asked to come with some of the children to collect whatever they have for us. We are always willing to collect because we need all the help we can get. She called on other members of the society to come to their aid by helping in feeding and clothing the children.